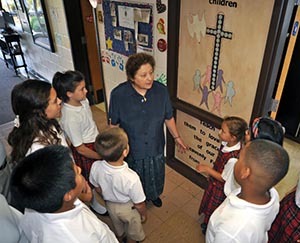 All congregations of Catholic sisters were founded for a purpose and with a vision. We use our mission statements and related documents to connect our purpose and vision to the particular way which guides our daily lives. Our community’s mission describes the basis of our spirituality and guides our decisions about our ministries, our outreach, and the way we live our lives in community. In addition to mission statements, we use related documents to deepen our understanding of the mission and to give us direction for living our vision in today’s world. These documents which include core values, vision statements, direction statements and similar documents are written after deep communal prayer and discernment. The Little Sisters of the Assumption bring together the least advantaged and the privileged in a spirit of family to inspire everyone to participate in creating a just society. Read more about our mission and values. The charism of the Benedictine women of Yankton, SD, is sharing our gift of seeking God through prayer, work, study and community life. View our video.